“The truth is out there …” ‘90s kids will recognize that tag line from The X-Files; the cult hit sci-fi TV show about a massive government conspiracy to cover up the existence of extraterrestrials was a cultural phenomenon. For the generation who grew up watching that show, it’s not hard to see the appeal of re-visiting the subject matter if only for the sake of nostalgia. 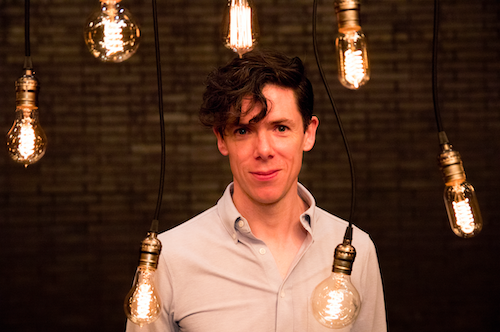 That cohort includes Toronto-based playwright Damien Atkins whose new play, We Are Not Alone, delves into the topic of UFOs and alien abductions. While Atkins is a prolific actor, having appeared on stage with numerous local theatre companies in a wide variety of roles over the past few years, for We Are Not Alone he chooses to appear as himself and addresses the audience directly throughout. Atkins takes a decidedly meta approach; the performance is as much about the process of writing the play we are watching as it is about the actual subject matter. After all, what better thing to do when when one is struggling to write a play about UFOs then write a play about struggling to write a play about UFOs. In the first part of the show Atkins cites documented evidence of alien visitations and focuses on the early history of UFO sightings—Roswell, Area 51, etc.—making good use of his old-timey radio announcer voice in what feels like a sketch comedy version of a TED talk. When he shifts to describing his visit to a UFO convention in Arizona he starts to waver between belief and skepticism. Atkins originally goes into the convention with an open mind but finds himself increasingly disillusioned by the fact that most of the people he meets seem obviously delusional. He ends the show with a nod to the late astrophysicist Stephen Hawking and his musings on whether or not we are alone in the universe. A 90-minute solo show that’s this self-referential is a big ask for an audience. As a whole, I thought the script felt a bit rough around the edges. There isn’t really an elegant through-line and the disparate pieces don’t necessarily fit together to create any sort of revelation or profound take-away. What largely redeems the show is Atkins’ performance. He displays his superb acting chops as he switches from character to character, physically transforming himself to embody a variety of larger-than-life personalities from his narrative. He absolutely sells it all with conviction, he’s charming and funny and manages to hold the audience’s attention throughout. Tying it all together is some excellent work by the design team; Kimberley Purtell’s lighting punctuates Atkins story with some impressive lighting effects in the tight space of the Streetcar Crowsnest’s studio. Likewise, the sound design (Thomas Ryder Payne, Dylan Green, Peter Balov, and Christian Barry) really brings the different environments described in the narrative to life. On the topic of UFOs, I came in a skeptic and this show didn’t change my mind, but on the topic of Atkins’ ability to act and engage an audience, I’m a true believer. We Are Not Alone is playing from January 7 – 26, 2019 in the Scotiabank Community Studio at the Streetcar Crowsnest, 345 Carlaw Avenue, Toronto. Tickets $33 – $50. Discounts available for students and seniors. Tickets are available online at crowstheatre.com.